THU 12 APR 2018 | 7PM | FREE! ​Francesco Kiàis | Italy/Greece | is an artist, an independent art writer, and curator. He created and co-founded a platform based in Athens and dedicated to performance art, the [mind the] G.A.P. - Gathering Around Performance. Last years he contributed, both as a theoretician and as an artist, to different educational and curatorial projects, among which the VENICE INTERNATIONAL PERFORMANCE ART WEEK. 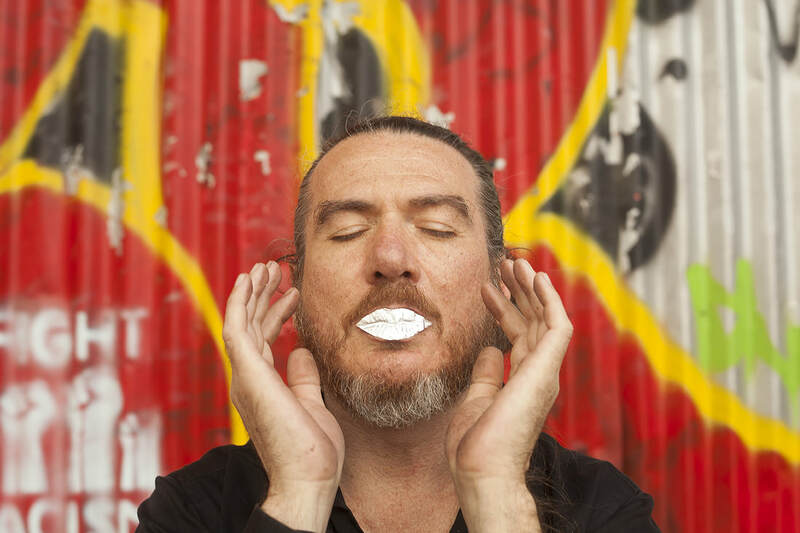 In 2017 he held a series of lectures on Performance Art at the Ionian University, Corfu, Department of Audio and Visual Arts, as an external collaborator. His last workshop took place at the Athens Fine Arts under the title "Body and Citizenship", aimed at a series of actions in the public space. Kiàis’ performance, The Robin [or The Redbreast], looks at the fragility of the Robin, as a tiny figure who migrates, overcomes borders, crosses cultures, and provides a parallel to the fragility of those who, today, are forced to move, facing a thousand obstacles, finding even death in their path, and of those who identify themselves in more than one place, in more than one culture. The concept of his action is based on the materials which once were used to realize the Byzantine sacred icons, like: silver leaf, and a natural coloured paste used as a base for the silver or golden leaves. Instead of the red paste, usually used for the gold leaves, I am using a black paste and silver leaves, referring to the night, which is the moment when the most migrants are trying to cross the Mediterranean sea. In Mediterranean cultures, this kind of symbology is frequently renewed through centuries and cultures, transforming the significance of symbols, but following a path that goes deeply backward through the millennia. In Italy, the country where the artist was born, and in Greece, the country where he currently lives, the reality of migrations and the reception of migrant people have a dramatic impact, and raises ethical issues towards the richest countries in the north of Europe, where migrants are rejected. At a certain point of the performance, viewers will put the silver leaves on the artist’s chest, becoming ideally like the surface of the sea at night, on which the light of the moon is reflected. A sea of desires for a better life, for some; a sea of death, for others. The Robin is related, in religious iconography, to the Passion of Christ and to the Virgin Mary. Francesco’s visit to Chicago is supported by [mind the] G.A.P. - Gathering Around Performance, with some additional support by The School of the Art Institute of Chicago Department of Performance. The artist would like to thank Mark Jeffery and Angeliki Tsoli, specifically. ieke Trinks | Netherlands | has been working with minimal means and high concepts since 2013, when she produced “meetings” in Chicago and performed in Defibrillator’s Milwaukee Avenue space. In 2016 she performed several of her “performance monologues” at Defibrillator’s Chicago Avenue space, a project that was initiated by her interest in performance artists’ private recollections of performing live. This time she returns to the city to undertake an intensive tour of spaces, speakers, exhibitions, and communities. She takes interest in found materials - the collection and remediation of discarded or unvocalized elements - and has set herself the task of assimilating and otherwise reframing her new research for this new performance at Zhou B. 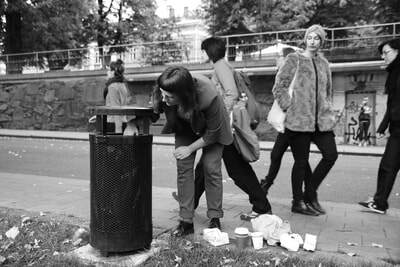 Next to her solo practice, Trinks is a member of TRICKSTER, a collective in Rotterdam, and co-organizer of Performance Art Event (PAE), an annual festival of live art in the Netherlands. Colin Roberson | New Orleans/Chicago | is a photographer and writer. 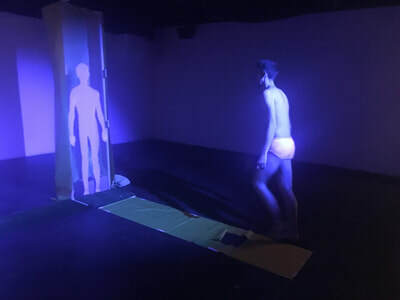 With ATOM-r, a Chicago based performance company, he has performed at the Victoria and Albert Museum in London, the Marlborough Theater in Brighton, and as part of the Queer Art & Film Festival in Prague. His work has been presented in Picture Newspaper, Juxtapox, The FADER, Hello Mr., MATTE, and The Ogden Museum of Southern Art. T Sam White is a sculptor and performance artist currently based in Chicago. Originally from central Pennsylvania, he recently relocated from Baltimore Maryland where he studied and worked. His practice incorporates adolescent memory and queer identity, framed through the lens of scouting, to form multi-media artworks and performances.